Anxiety currently affects about million people in the United States and is said to be the most common mental illness that we face. It often causes its victims to experience trouble eating, sleeping and concentrating and may also manifest in the form of depression or panic attacks. But as common as anxiety is, according to the Anxiety and Depression Association of America, only one-third of people who develop the disorder are actually diagnosed and treated. What those of here at FHC have noticed over the years, is how likely anxiety is to occur later in life. In fact, roughly 10 to 20 percent of seniors in America suffer from anxiety – even more often than Alzheimer’s and dementia. Many elderly patients with the condition have had It most of their lives and often times those who develop anxiety later in life may find the signs are harder to detect. Medical professionals say it’s a condition that’s more difficult to diagnose in older adults because they often complain about physical symptoms instead of psychiatric ones, have a number of medical issues, don’t realize they have the disorder or even avoid it altogether. 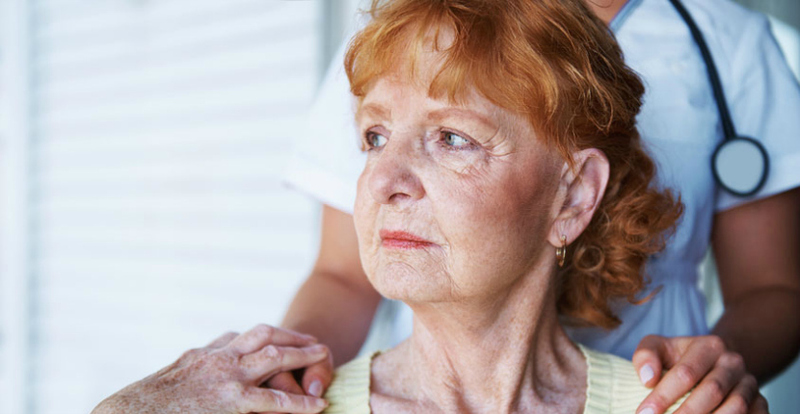 Unfortunately, without proper treatment and personalized elder care, anxiety can actually worsen chronic medical conditions, leading to fear and isolation. This may ultimately affect the morbidity, mortality and quality of life in those who suffer from it. One of the most common forms of anxiety is generalized anxiety disorder (GAD). While it shows up most often in elder patients, it can also be brought on by acute illness or a traumatic event. Many people with GAD report persistent and excessive worry or the anticipation of disaster without reason. They may be overly concerned about money, health, family or work or see themselves as being vulnerable and unable to cope in everyday life. Anxiety in seniors can also interfere with social activities and family life. They may have more frequent visits to the doctors and are more likely to be hospitalized than others without the condition. We’ve found that some of the ways GAD develops include brain chemistry, personality, genetics, and distressing life events. In addition to sleeplessness and the inability to concentrate, seniors can experience fatigue, irritability, muscle tension and restlessness. Even more concerning is that symptoms in the elderly can also overlap with other issues like depression and occur simultaneously with another illness – making harder to identify. According to the Anxiety and Depression Association of America, treating anxiety is most successful when there is a partnership between the family, patient and physician. Because many older adults are already taking medications for other conditions, the doctor may prescribe medications that work well together and with the least possible side effects. Other treatments may include Cognitive Behavioral Therapy to lessen escape and avoidance behaviors, alternative and social support systems to help alleviate fear and isolation. If you are looking for a home care provider for your senior or loved one, Freedom Home Care is here to help.